Imagine your holiday lakeside on a quiet cove in a rare mid-century architectural gem with walls of glass bringing beautiful relaxing views of lake lbj right into your living area. Our home sits in the middle of a one acre lot on a quiet cove providing privacy and views you rarely find on the lake. When you wake in the morning even without leaving your bed, you can survey the lake for the day's conditions on the water – ready for a morning slalom, or interested in casting a line, your day can’t start better than this. This unique property was built in the late 60’s. It’s not a house on the lake, but a lake cabin retreat loaded with character, views, privacy, and surrounded by nature. The decking that surrounds the main and guest cabin project out into the canopy of the mature trees that cover the hillside lot. While you will not find any manicured grass on the property the main cabin deck, guest cabin deck, mid-level deck and spacious multi-slip dock provide the perfect vista’s to enjoy the lake (and views of the neighbors green grass!) to the fullest! There are two separate cabins on the property connected by a covered breezeway. The main cabin houses the master bedroom and bath, the galley kitchen and the combined living and dining room. The guest cabin has two bedrooms, one with queen bed and two bunk beds and the other with a queen bed. These two bedrooms share a common bathroom with shower. Step outside from either of these bedrooms through private doors and there is decking everywhere to enjoy your morning cup of coffee, an afternoon book, or an evening glass of wine all while sitting in the tree canopy with incredible views of the lake. There is plenty of parking on the property with room for two vehicles on the street in the pull out area and a parking area with room for additional cars, trailers, and an electrical hookup for an rv. From the main cabin deck, stairs lead you down towards the lake with the mid level deck one flight down on the hillside and in the trees. From this shaded vantage point, you can relax on the Patio furniture or have lunch on the picnic table while being just a stones throw from the lake. A few more steps take you to the dock which was designed and built to accommodate a large group with room for all. The main dock faces 200 feet of natural undeveloped shore line. Some of the best fishing on the lake can reached within a cast of our dock – the water depth in this area (15ft) hides the wooden debris on the bottom that makes this partly shaded/partly open water a favorite spot of LBJ fisherman (and the fish too). In the summer of 2011 in a 4 hour span, six different species of fish were caught (and released) from the dock by one fisherman! Turn on the flood lights at night and drop in a line or show the kids how easy it is to catch blue gills. If you love fishing, it doesn’t get a whole lot better than this from the shore! Of course time at the lake is not complete without time on and in the water. Swimming is great in the deep water off the dock. Life jackets are a must for the young kids or non swimmers. Boat traffic into the cove is light, and the heavy waves that can develop at open water properties are non-existent here. There is an open boat slip with an electric lift for your boat or water craft. A kayak and standup paddle boards are available for use and the guest boat house is loaded with deck chairs for family and friends. Outstanding views, very private, on a quiet cove, an architecturally a gem. Quiet private cove location, very private setting with out close neighbors. On Street and off Street Up to six cars. 6 person dining table in door. 8-10 person table outside. Yes, local cable channels and Apple TV. Outdoor Speakers at the main cabin deck and a the dock area. Kayak and Standup Paddle Boards. Two Boats slips available for use upon request. 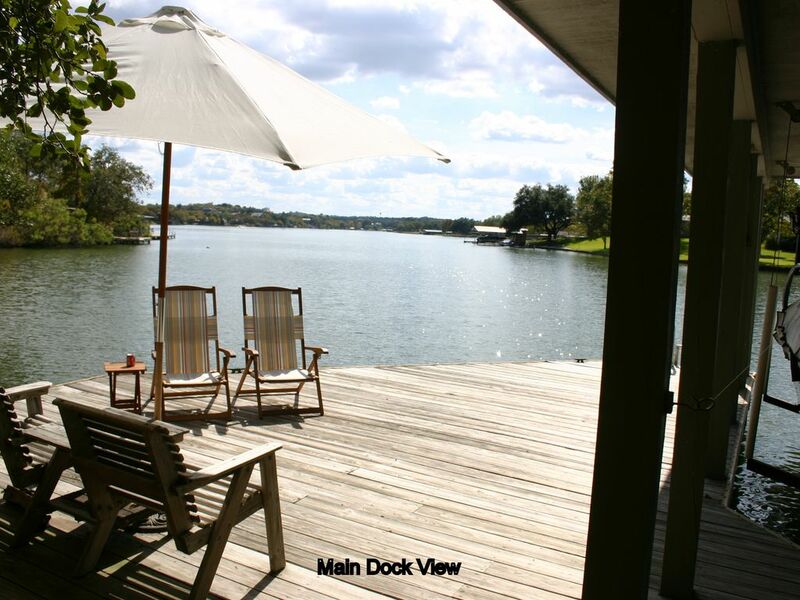 We loved our two month stay at this charming house with incredible Lake LBJ views. We enjoyed the multiple decks and appreciated having the separate two bedroom guesthouse. The owners were responsive to any question we had during our stay. We would happily rent this place again, and we highly recommend!